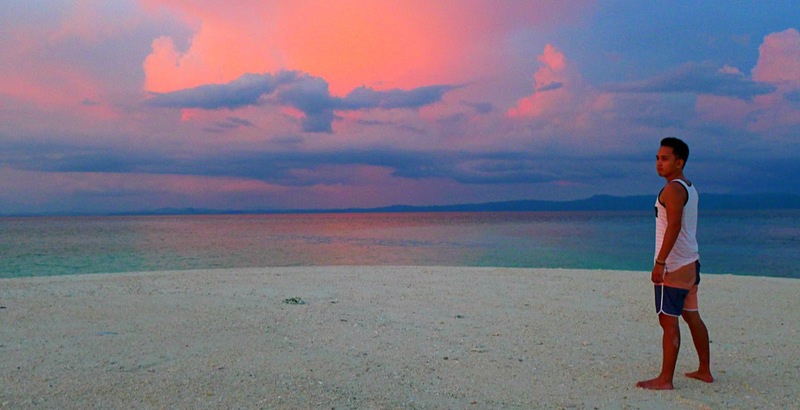 Kalanggaman Island is getting all the attention as a top summer island getaway in recent years. 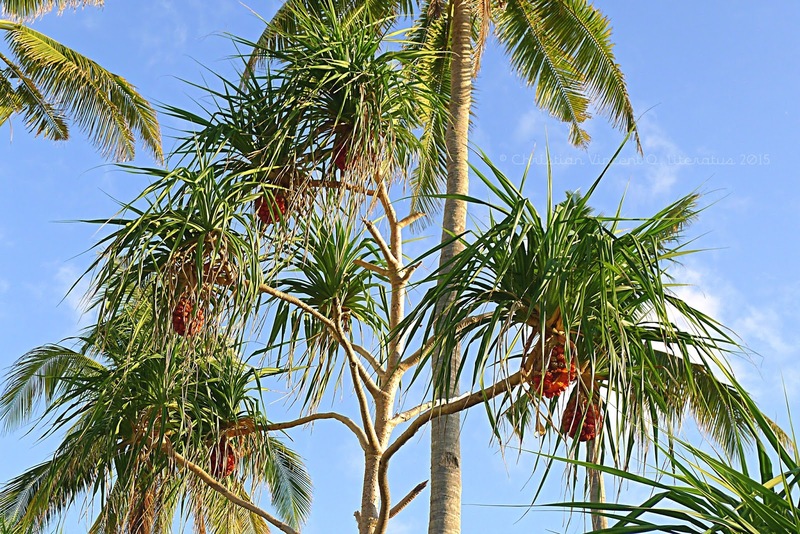 The island has everything you ever dreamed of an ideal island vacation. The pristine shores, cerulean sky and the invigorating water. 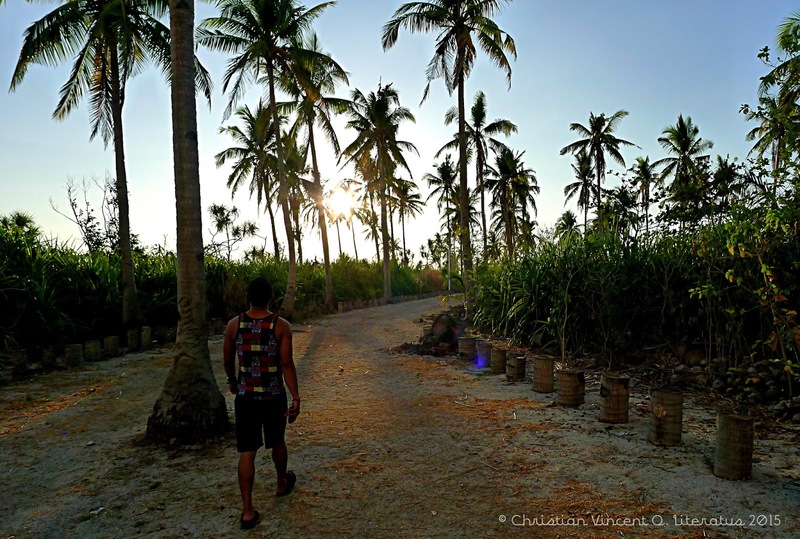 We already have that vivid picture in our mind of what this tropical island paradise can offer us but there are so many other details of Kalanggaman Island that a picture cannot convey. This is what this blog post offers you — an insight of the 10 best kept secrets of Kalanggaman Island. Kalanggaman is from a local dialect which means "bird" and they name it as that not for the diverse species of birds living in this paradise but because of the shape of the island that looks like a bird in an aerial view. I have been here twice already and still not enough to experience everything the island has to offer. There is so many opportunity for exploration here. Be it the birds, plants, marine life and all the nook & cranny hidden in the different part island. The island is huge covering around 753 meters of land mass and only 1/4 of it are developed to cater to the needs of the tourists. I collated these information based in my observation and from the locals that I was fortunate enough to share stories with. 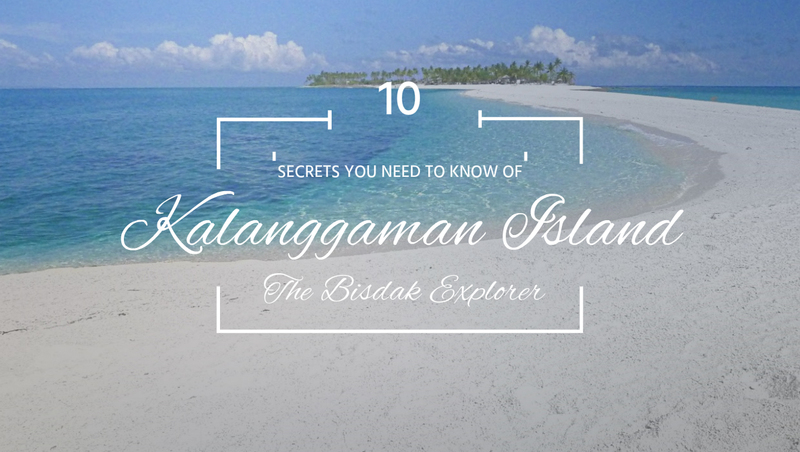 Here are the 10 secrets that you need to know about the island of Kalanggaman. 1) The wild side of the island. You might not expect it but Kalanggaman as of now still has an undeveloped side where the ecosystem of the birds are still kept intact. In my morning walk towards that side I see some species of a flightless birds that rummage for food in the ground and sprints quickly towards the meadow. I thought they were quails but they don't look like one and so I asked some friends in Palompon but they were unaware of its existence. Occasionally I see some herons as well resting in the branches of some trees. It is a short 20 - 30 minutes walk to reach the hidden beauty in the other side. 2) The hidden patch of heaven. 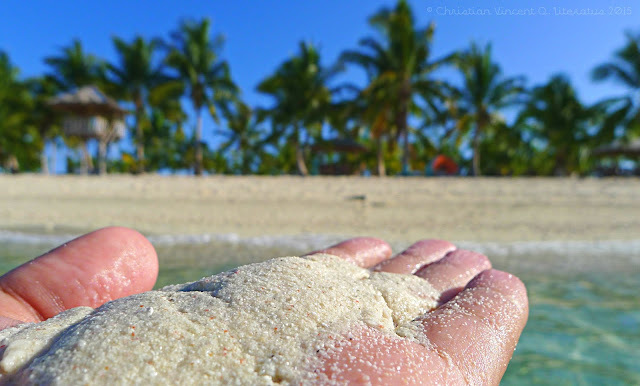 The picture we see of Kalanggaman Island may have that picturesque powdery white sand but up close it is mostly corals and sea shells that can be a little rough barefoot. Don't fret though because there is that side of the island who manage to capture that perfect white sand quality that Boracay and Bantayan Island are famous for. It is on the left part of the island where you can reach after going through that wild side stroll. I wasn't able to explore this side on my first time here and I was super ecstatic to discover this beautiful spot. 3) An unexpected sanctuary for your faith. They have a small chapel here if you are the type who allot a time in your day to have a good conversation with the Lord. 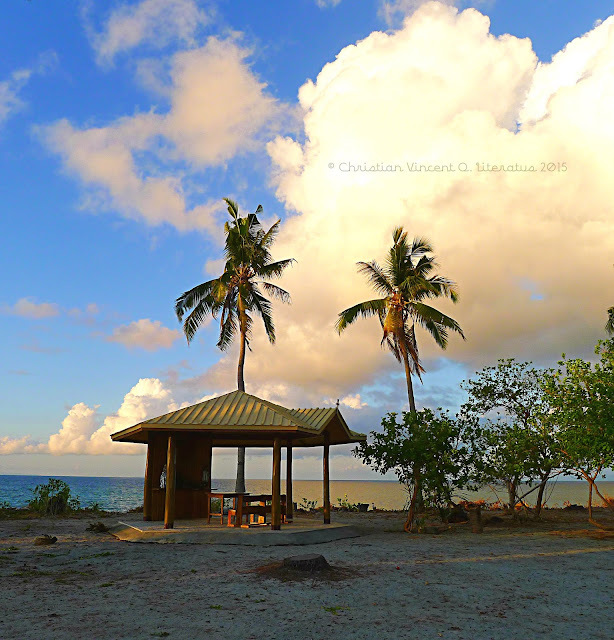 For Christian groups who comes to the island this is a perfect spot for a much needed fellowship because it is far enough from the crowd and offers solitude. You can pass through this spot when you go to the left side of the island. 4) The secluded ( and the longest ) sandbar in the other side. 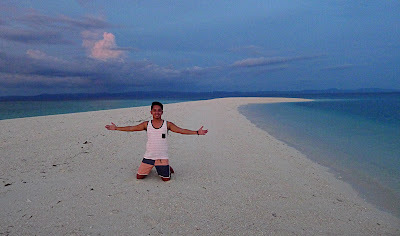 Unexpectedly, the infamous spot where the crowd stay is not the only sandbar in the island and not even the longest. If you explore the wild side of the island you will be rewarded with a perfect quality of white sand and if you're lucky the elusive sandbar will reveal its beauty before your very eyes ( sadly for me it didn't ). According to a friend, it is not as big as it once was after the super typhoon Haiyan (Yolanda) devastated this paradise. It is now just a small strip of white stretching quite far. 5) It is a pink island, sometimes. There is actually a phenomenon called pink beach. I've visited quite a few of them in the Philippines. There's one in an island in Sorsogon, Zamboanga, Davao etc. This happens when there is large concentration of precious coral ( corallium rubrum ) commonly known as red coral growing near the beach. 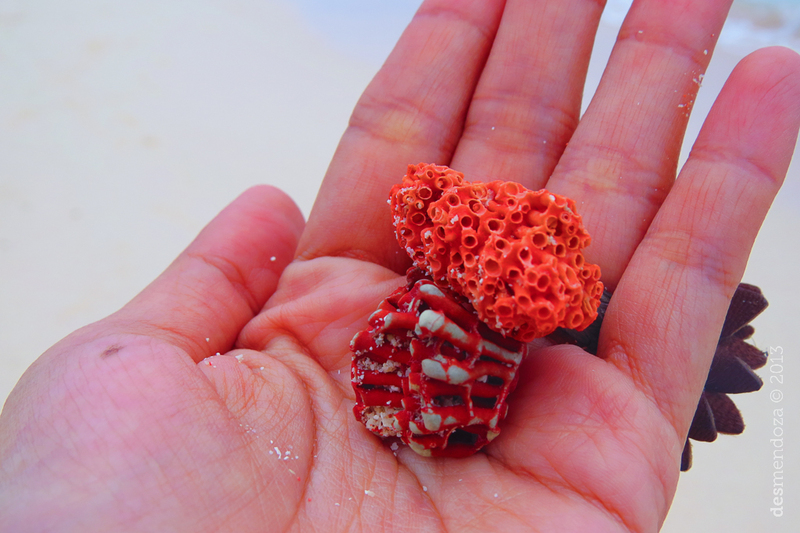 This coral is very durable and can leave pink skeletons behind which when mixed with a white sand can result in a distinct pink color. 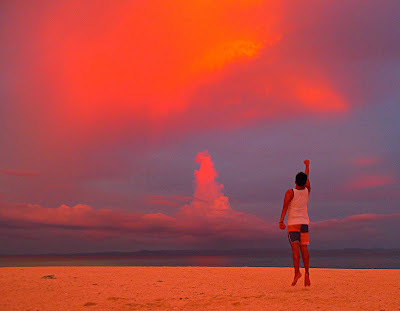 Now I've learned by talking to a local in the tourism office while waiting for my boat that Kalanggaman Island can turn pink in specific time of the year. They said it is usually around the rainy season and I have no idea how to make sense out of that story because other pink beaches are pink all year round. I did a little investigation and I really did see small traces of red corals in the sea bottom but not enough to turn the beach pink. 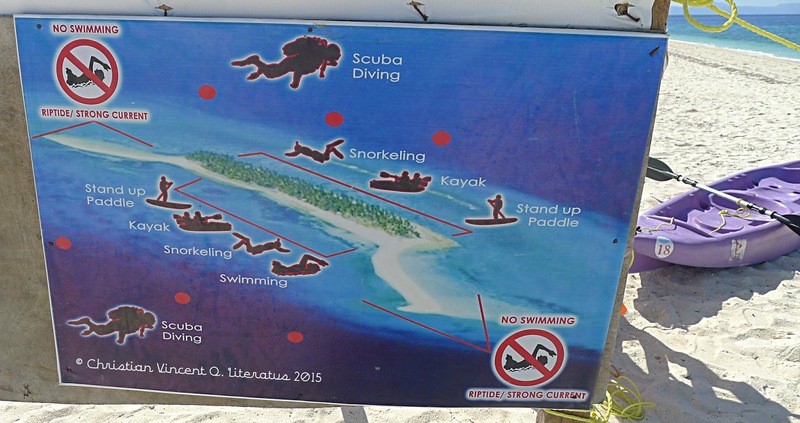 6) The sandbar is not what you think it is. I know what's going on in your mind right now. 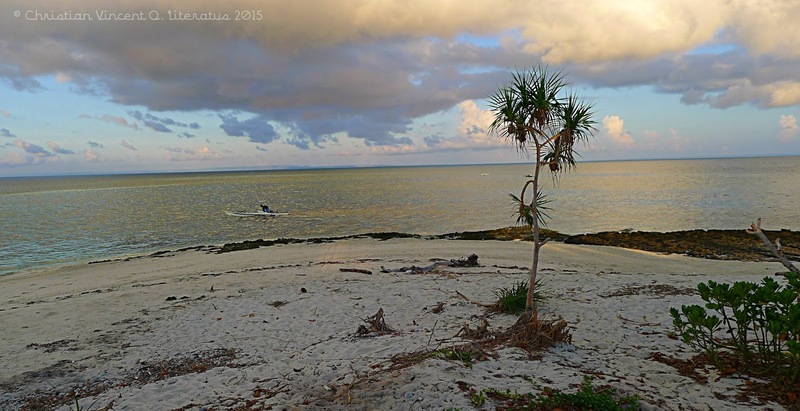 How lovely it is to stroll through that spotless sandbar barefoot. Think again! Up close the sandbar is not made of powdery white sand but is actually mostly shells and skeletons of dead corals as what all sandbars are. 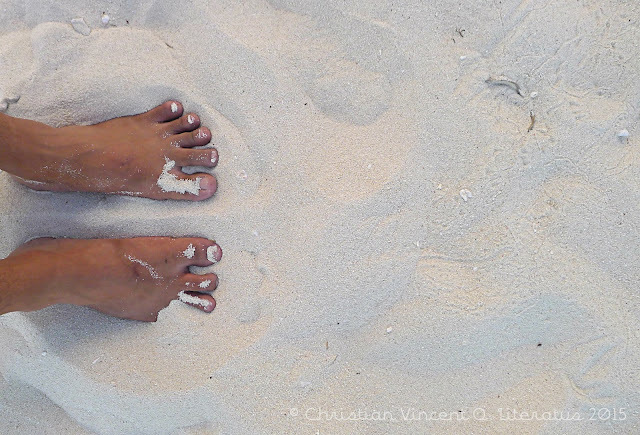 It is best to wear slippers when you are exploring the sandbar but if you insist in walking barefoot try the sands near the water because is soften by the sea. You'll thank me later when you are there and an umbrella will do wonder as well. 7) Some magical moments happen after sundown. We are so used to seeing that pristine white Kalanggaman in the photos during daytime that I get this idea that it gets boring at night. Boy! I was so wrong. 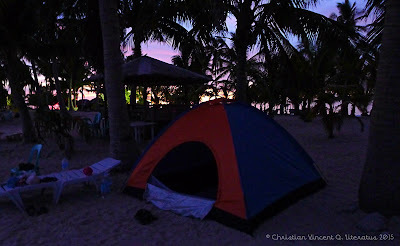 I used to say why bother staying overnight in an island without electricity, fresh water and soft comfy bed. Then it happened and I was astonished of the magical experience I've had. The wonder started with a mystical sunset. As the sun slowly rests down in the palm trees I was filled with so much emotions of its unrivaled beauty as its light turned the water to crimson red. Eternal peace filled my senses as I watch it slowly disappear in the horizon. The nautical sunset has broken that solitary time with a live show of colors in the sky. I was in the farthest end of the sandbar at that time and the best word that I can explain it is otherwordly. It is not just sea which turns red this time but the sand as well. It almost feels like a mysterious cloud above me beaming down a red light. The horizon is bursting with colors that only nature can create. I never thought I'd encounter such a beautiful experience. Just when I thought the nighttime will come with no surprises I was wrong again because the island is saving the biggest surprise when darkness fully covers the island. So I decided to have a night swim and star gaze at the same time. The sky is an ocean of stars with the absence of light pollution from the city. I can easily identify planes hovering in the sky above me and as expected there are UFOs as well playfully moving in between the stars. What caught my attention is the eerie glow I noticed in the water and when I found the courage to approach the glowing thing it moves away. So I never really got the chance to identify what it is but most likely it's probably a school of fish. What fascinates me the most is when I was enjoying my bath I noticed some pixie dust kind of glow appears when I muddle the water. 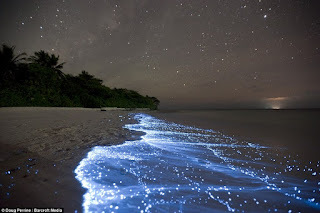 It probably some glowing plankton in the dark but nevertheless it was magical and reminded me of the picture I once saw in the web. 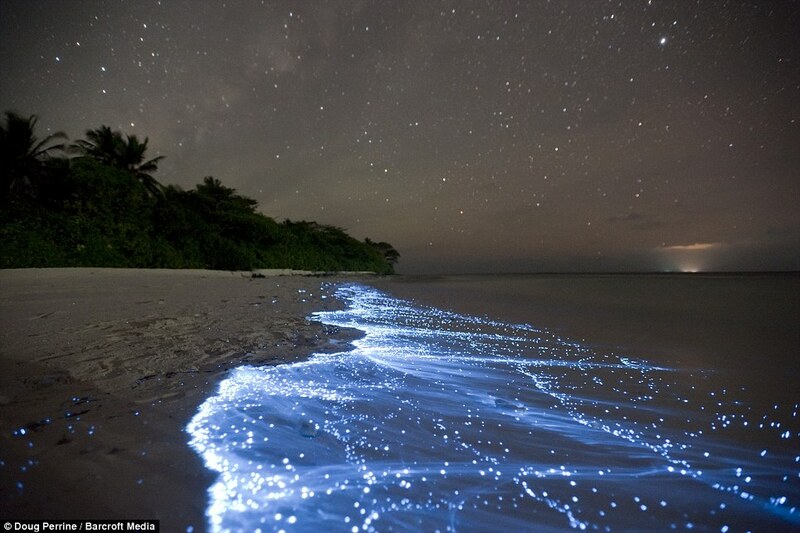 It looks like this with a green glow and appears only when I disturb the water. 8) The different activities the island has to offer. As seen here there are a lot of activities now that the island has to offer though I have never tried a single one of them because exploring the island takes priority. Scuba diving & snorkeling would definitely be a must try in the next time I'm back in the island. 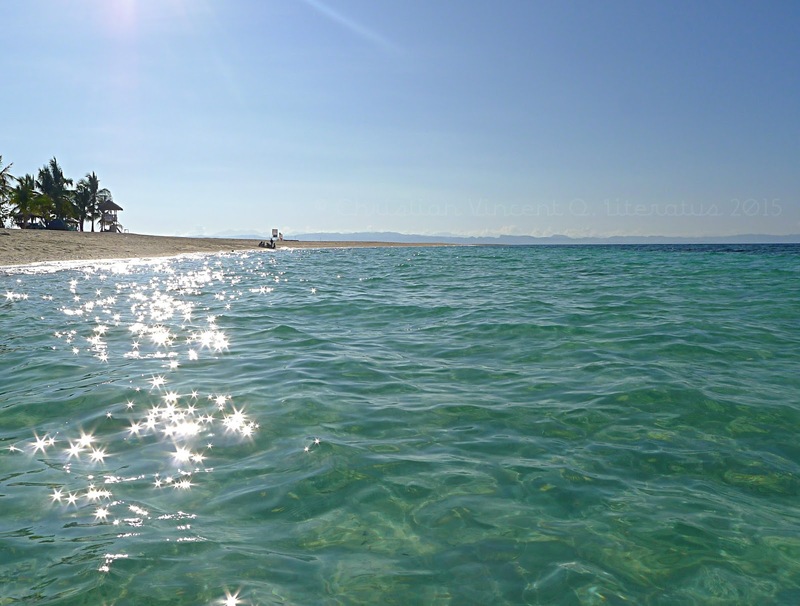 9) The tempting crystal clear water that is hard to resist. Undoubtedly, my favorite quality of Kalanggaman Island is its crystal clear water and diverse marine life. I literally see a group of fish near the shore and occasionally some huge ones jumping out in the water when I did a morning stroll. When I finally decided to take a dip in the morning I never want to come out of the water. I was wiggling with happiness because of how soft the sand is and literally see my feet of its clarity. It played a trick in my mind when I thought I see a snake in the bottom when it is just actually just a stick. It is THAT CLEAR that you can see anything in the bottom and you will be swimming with a lot of fish because the fishes in that island, for some unknown reason, are not reluctant to approach people. 10. The most ideal time to get a picture perfect of the flawless beauty of the island. The beauty of the island can be quite stubborn to capture. 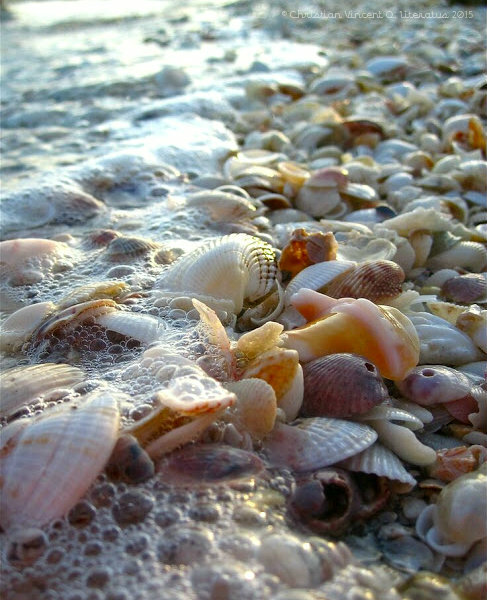 It is not always that beautiful in your photo any time of the day and even during noon time the color of the sand turns to ivory. What is the best time you'd ask? Well... I discovered it is best to stroll in the sandbar and have that photo shoot you've been planning around 8 in the morning until around 10 because the sun still not that harsh for you and your photo. A few minutes after the nautical sunset gives you a picturesque moment as well with the white sand and the beautiful horizon. The time would be somewhere around 5:30 pm to 6:00 pm. This is the most ideal route to get to the island. 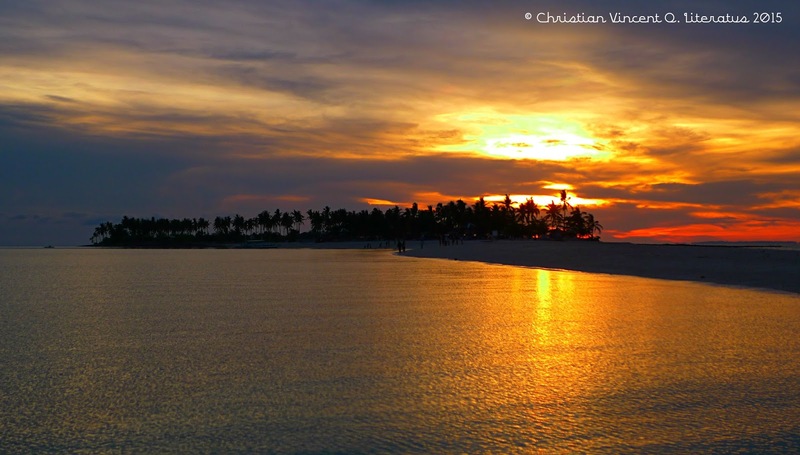 Palompon owned the right to Kalanggaman island so they do their best to preserve the beauty of the island. Guests will be properly oriented of everything about their stay most especially the waste disposal. During peak seasons, they limit the guests allowed to the island so for the groups not permitted will not worry because they have accommodations in the tourism office and prepared another set of activities ( Palompon's Terrestrian Eco-Adventure ) for the guests. 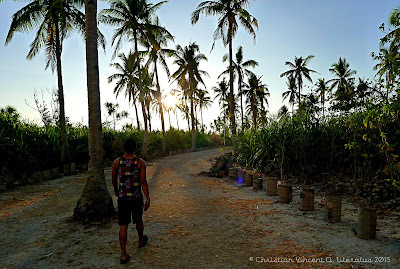 This is the famous route for people coming from Cebu and beneficial in many ways. You get to experience the beauty of two beautiful islands in one day. The rate is justifiable but you will be spending much time and money already getting to Malapascua. Once you arrived in Malapascua island you will be swarmed with guides offering day tours to Kalanggaman island. This route is best experienced in a group. This the standard route for people coming from Cebu. SIOCON to KALANGGAMAN via BOAT : Php 9,500.00 boat rental with 20 people capacity for 3 - 4 hours. Registration here may add an additional Php 100.00 from the regular rates of Kalanggaman. I accidentally found this route on my way back. I hitched a ride from a group staying overnight and they came from Mactan Island. I asked for the rate of the boat for the whole trip and it is really quite expensive ( Php 13,000.00 + ) but it is a huge boat and can accommodate 25 people. I paid Php 500.00 on one way back to Cebu through Mactan. The boat trip took 5+ hours in the sea. This is advantageous for a huge group and saves the travel time by a lot.